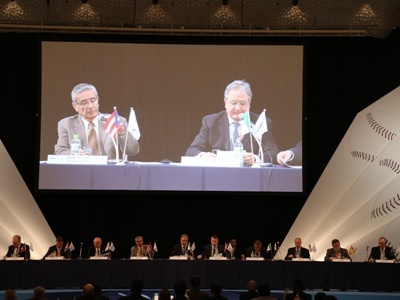 The first 2 sessions of the 2013 IBAF Congress had a strong Olympic flavour, even if the launching of the World Baseball Softball Confederation is scheduled for the afternoon. Tsunezaku Takeda, President of the Japanese Olympic Commitee, and Ryozo Kato, Commissioner of NPB, made both strong statements in favour of the reinstatement of baseball and softball in the Olympic Games. Takeda mentioned the importance the sports may have if the Games are played in Tokyo. "I am impressed by the fact that baseball here in Japan is not only a game, it is part of the country's culture" commented IBAF President Riccardo Fraccari "And Ryozo Kato taught me that as soon as I met in 2009". Takeda and Kato were joined by Japan Baseball Legend Sadaharu Oh and by Commissioners of the pro leagues of Korea (KBO, Koo Bon Neung) and Chinese Taipei (CPBL, Hwang Jenn Tai). MLB Commissioner Bud Selig was not in Tokyo in person (he was represented by Asia Director Jim Small), but his statement via video on MLB support to the Olympic project was pretty clear. IOC Member Reynaldo Gonzalez made a strong and emotional speech: "IBAF and ISF are giving a lesson of their love of the sport and their olympic spirit, by merging" the cuban official said. "In this moment we need to stand as one. And remember: St. Petersburg is the key, there's no meeting in Buenos Aires if we are not in the shortlist". Gonzalez asked all of the countries present to interact with their respective IOC members. The Congress officially (and unanimously) approved the postal voting procedure that led to the merger with the International Softball Federation (ISF), represented on stage by President Don Porter. A formal but needed step towards the launching of the campaign for reinstatement in the Games. Many words were spent during the Congress to praise the success of the March World Baseball Classic and the gold medal winning Dominican Republic was officially congratulated. At the role call 69 countries were present, thus guaranteeing the needed quorum; another role call will be made before the elections. Secretary General Israel Roldan made it official to the Congress that Afghanistan, Haiti, Gujana, Nepal and Sierra Leone are now IBAF Full Members, while Curaí§ao and Saipan become Provisional Members; 4 professional leagues (ABL, Australia; NPB, Japan; KBO, Korea and CPBL, Chinese Taipei) become Associate Members. The Congress approved the financial report by Treasurer René Laforce (IBAF budget is a little less then 2 million US dollars), who expressed his satisfaction for the goals he reached and explained that the next budget (that previews a positive result for the first time after 4 years) will have to be approved by the newly elected Executive. The IBAF Awards went to Pablo Carpio (Spain, scorer of the year), Osmel Pimentel (Venezuela, umpire of the year), Fujinami Shintaro (Japan, Junior male athlete of the year), Yukari Isosaki (Japan, Women Athlete of the year), Jim Van Ostrand (Canada, male senior athlete of the year) and to the Mexican Federation. The IBAF also awarded the official sponsors of the organization (Brett, Mizuno, SSK and Kenko), PONY League and the organizers of the 2012 tournaments.